What is the genius within? Back in 1999 when I met Michael Kiriac, PhD, ND, scientist and inventor of Bio-Algae Concentrates, he told me that consuming BAC is a vastly different concept then supplementing with 23 different supplements, which is what I was doing at the time. He explained that because of its completeness, balance, synergy and ultimately its extraordinary bioavailability, BAC is an extremely efficient food that can easily reach areas of the brain that are more difficult to feed than others. He told me that BAC has the power to “awaken the genius within”. Of course he was referring specifically to the hypothalamus, or the “governing” organ. 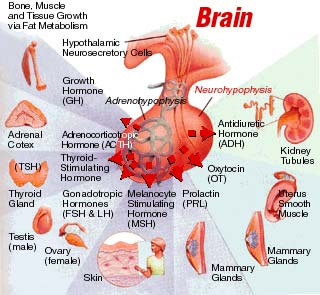 The hypothalamus is a region of the brain that controls most of our metabolisms and bodily functions. It is located in the middle of the base of the brain and encapsulates the ventral portion of the third ventricle. The main function of the hypothalamus is homeostasis, or maintaining the body’s status quo. Factors such as energy, blood pressure, body temperature, fluid and electrolyte balance, and body weight are held to a precise value, called the set-point. Ultimately, the hypothalamus along with its two principal allies, the pituitary and the pineal glands, is responsible for regulation of all physiological metabolisms. These metabolisms include the endocrine system, the sympathetic and para-sympathetic nervous systems, the central nervous system, the lymphatic system, the cardiovascular system and the digestive system with its assimilation, absorption and elimination functions. The hypothalamus and its allies are so important that they have gained the reputation of being “the guardians of health”. In essence, all metabolic functions report back to and are governed by the hypothalamus – the genius within. In this section, I will focus the discussion on the hypothalamus and will not address the brain itself as it will be the subject of another section. The hypothalamus, like any other part of the body, is comprised of billions of cells, each with its own cellular activities to perform. Only when the cells that make up the hypothalamus are healthy will the hypothalamus adequately perform its own overseer metabolic role. In order to be healthy and perform their activities, cells need hundreds of critical nutrients, many of which are required daily. Only with these nutrients and the energy derived from them will cells be able to grow, repair, defend from attacks and perform their localized metabolic functions. The hypothalamus, unlike the brain, is not protected by the blood brain barrier and is therefore subject to microbial and other attacks. Because of its location within the head it is also more difficult to nourish adequately, which becomes an even greater problem as we age and become less efficient at assimilating certain nutrients from the foods we eat. Of course this problem is compounded by our choice of foods which are often depleted of nutrients or inassimilable. Often, this problem is already present at birth due to the mother’s genes and deficiencies or will manifest early during infancy due to poor nutrition. When the cells of the hypothalamus are starving, toxic or plagued with acidosis or other bacterial infections, you’ve got a problem. From the diagram and description of its role above you can imagine the resulting cascading problems that can arise when the “guardian of health” itself becomes atrophied. As per Hippocrates’s advice: “let thy food be thy medicine,” all good foods have the potential to nourish and heal. For this healing to be a reality, the nutrients in the food we eat must be assimilated and absorbed by the cell wall in sufficient and required quantity. Because of bad food choices, aging and other metabolic deficiencies, this becomes quite difficult to achieve and cellular disease takes over. Whole food – In natural and holistic nutrition it is well known and proven that whole foods are the way nature was meant to be and that quality not quantity counts. For example, a miniscule amount of Vitamin C as it occurs in a whole orange or green pepper is tremendously more nutritionally functional than a mega-dose of isolated ascorbic acid. Organic – The “Bio” in Bio-Algae Concentrates means that it is of a living organism and that it is not isolated or separated. It is grown without the use of synthetic fertilizers, pesticides, antibiotics, growth hormones or feed additives. Micro food – This is a key characteristic of BAC that explains why such nutritional power can come from such a small source. BAC’s algae are selected microalgae that hold extraordinary nutritional value for their size. The microalgae in BAC are invisible to the naked eye but they deliver more nutrients than any visible food particle. Furthermore, there is no extraneous material in these microalgae such as fiber, fat, bulk or water. This makes BAC extremely digestible and non-toxic and means that it has minimal assimilation and elimination burden for the body. BAC is pure energy. It is the food that salmon and even some whales live on. Complete – Most foods, like an apple, are whole within themselves, but an apple does not contain all of the required nutrients that we need to sustain life. BAC is not only whole, but it is also the most complete food on earth containing all daily required nutrients and thousands more. There are over 5,000 known nutrients in BAC including Vitamins A, B, C, D, E, and K, all known minerals and trace elements, all known amino acids, a full protein makeup, chlorophyll, an array of mixed carotenoid antioxidants and over 4,000 enzymes. Balance – There are four microalgae in BAC. Each alga is a whole food and is naturally balanced within itself as is most food. However, anytime you mix different foods together you must be concerned with the chemical interactions as per the science of food combination. For example, eating watermelon after a steak is a nutritional disaster that will cause digestion problems. It took nine years of intensive research to formulate the optimum balance found in BAC, patiently selecting the most compatible algae amongst the 1,000 investigated. Bioavailability – BAC has an exceptionally high overall utilization ratio with no resulting toxicity. For example, its human active proteins have a 95% net utilization ratio while its calcium has a net utilization ratio over 90%. Several of its nutrients such as beta-carotene, alpha-carotene and astaxanthin have been proven to penetrate the blood brain barrier. This sort of bioavailability and net utilization is possible because of the previously mentioned characteristics: whole food, organic, complete, micro food and balance. Synergy – At the molecular level, synergy is real. Synergy is what makes a violinist a virtuoso. Once the 5,000 nutrients in BAC are subjected to the digestive enzymic breakdown, they further explode into 50,000 subnutrients and millions of submolecules that are assimilated into the blood and distributed within seconds across the entire body to nourish trillions of cells. BAC is supernutrition that delivers optimum cellular nutrition. What are the benefits of consuming BAC? We are energy beings. We live off the energy that we derive from the food we eat. When the cells of the body receive the nutrients and energy that they need, they, like a good virtuoso, will perform their multitude of cellular metabolic activities: growth, repair, cleansing, regeneration and more. When each cell of an organ performs its job well, the organ will have a fighting chance to perform its metabolic activities such as blood sugar regulation in the good example that is the pancreas. But as per the diagram presented above, let us not forget that cellular activities and organ metabolic functions are governed by the glandular level which itself is overseen by the “master gland”, the hypothalamus. There is no doubt that the nutrients in BAC efficiently nourish all of the cells of the body including those cells of the hypothalamic region. Several phytonutrients and pigments found in BAC, including beta-carotene, alpha-carotene and astaxanthin, have been shown in human clinical trials to be able to penetrate the blood-brain barrier and furthermore penetrate the blood-iris barrier. When the genius within is awakened, like any good commander, its first mission is to restore the balance within his team: the endocrine glands, or the guardians of health. When the endocrine glands are tasked by the hypothalamus they have no choice but to obey its hormonal commands. 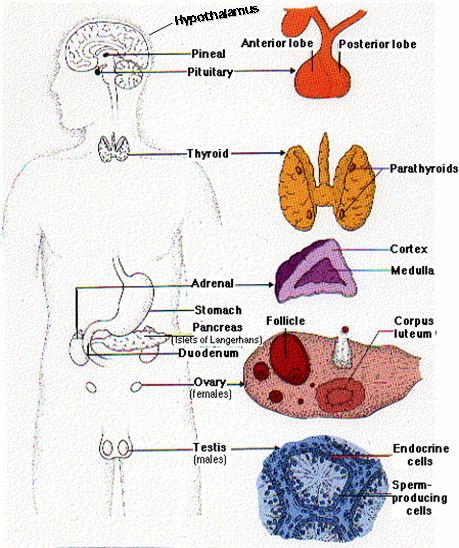 These glands are largely responsible for triggering the metabolic activity of the various organs and systems of the body. At that level we can mention a few specific systems such as blood insulin level, pH levels, cardiac function, selenium and calcium activities, and more.